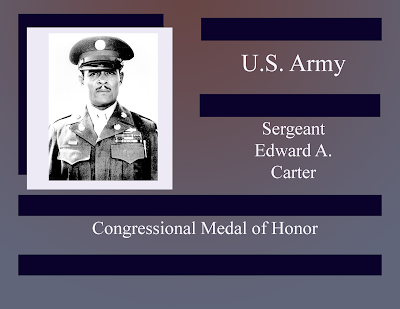 Sergeant Edward A. Carter was born on May 26, 1916 in Los Angeles, California. As the son of missionaries, he grew up in India and China, and learned four languages English, Mandarin, Hindi and German. His first brush with combat was in 1932, at the age of 15 when he joined the Chinese Nationalist Army during the Shanghai Incident, during the Second Sino-Japanese War. Sergeant Carter's next combat enlistment was with the Abraham Lincoln Brigade, a group of American volunteers that supported the Spanish loyalists during the Spanish Civil war. He enlisted in the U.S. Army and while assigned to the 56th Armored Infantry Battalion's 12th Armored Division Sergeant Carter earned a Congressional Medal of Honor when, after his tank was disabled, he, armed with a bazooka and having five wounds, still managed to kill six enemy soldiers and took two hostage. Sadly, he was denied re-enlistment in 1949 because he was a suspected communist (due to his serving with the Chinese army at 15). He worked in the tire industry until January 30, 1963 when he died of lung cancer.